In the book, Panarchy, Gunderson (2002) describes how an ecosystem goes through the adaptive cycle. An ecosystem begins its existence in the alpha phase of the adaptive cycle with potential for growth, resource accumulation and storage. For example, the sudden availability of a new land mass is likely to encourage the development of new plant life. Many types of organisms will attempt to grow and live in a new region. Some will fail, and others will succeed. The surviving organisms take the ecosystem into an exploitation phase. As the exploitation phase develops, surviving organisms can take full advantage of all the resources of the ecosystem. Competition between types of vegetation commonly occurs, especially between pioneer species and species from other cycles. The more aggressive and better suited types of plants and animals are more likely to persist. As an ecosystem begins to reach its conservation phase, it becomes more vulnerable to shocks. The vegetation that has established dominance will likely continue to expand in the context of broader ecosystem expansion and development. Correspondingly, the ecosystem develops a system of relationships that control external variability and help to reinforce this expansion. As a system nears the end of the conservation phase it becomes very rigid and susceptible to change. Once an event is triggered, previously stored resources are released. This release can happen slowly or quickly and is followed by a transition from the release period to reorganization (a period marked by uncertainty). Remaining resources, that had been accumulating, break down so that they can be reused for a future ecosystem. A subsequent cycle begins again at the reorganization phase (Gunderson p.41-45, 2002). Image 15 “A stylized representation of the four ecosystem functions (r, K, α, Ω) and the flow of events among them. The arrows show the speed of the flow in the cycle. The cycle reflects changes in properties: (1) Y axis-the potential that is inherent in the accumulated resources of biomass and nutrients; (2) X axis-the degree of connectedness among the controlling variables.” (Gunderson p.34 2002) The r box represents the part of the adaptive cycle occupied by exploitation phase. The K box represents the part of the adaptive cycle occupied by the conservation phase. The α box represents the part of the adaptive cycle occupied by reorganization. The Ω box represents the part of the adaptive cycle occupied by release phase. 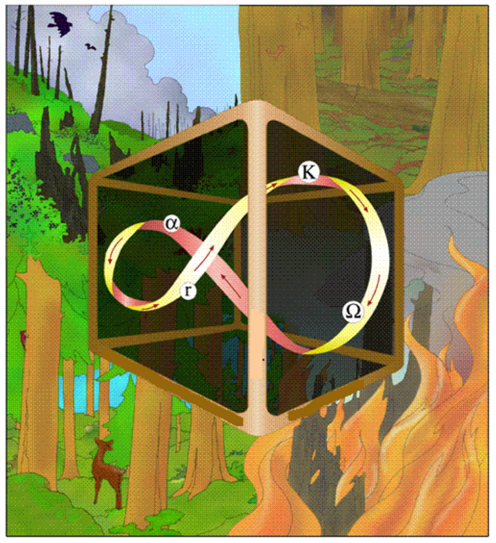 The image in the background shows an illustrated ecosystem going through the 4 phases of the cycle.